Cruise to Tangier Island from Reedville, VA, aboard the Chesapeake Breeze. The Breeze leaves from Buzzard’s Point Marina for Tangier Island every day at 10 a.m. and returns to Reedville at 4:15 p.m. Enjoy a wonderful day out on the Chesapeake Bay and Tangier Island. On the way to the island, the ship often passes fishing boats working their nets or large ocean freighters traveling between Baltimore and Norfolk or points beyond. You can also see Tangier Island watermen making their living on the bay. After a relaxing one-and-a-half-hour narrated cruise, the ship docks at Tangier Island, where you are met by a friendly guide. During your two-and-a-half-hour visit, you may wish to eat a family-style seafood meal at the famous Chesapeake House or one of the other restaurants on Tangier Island. 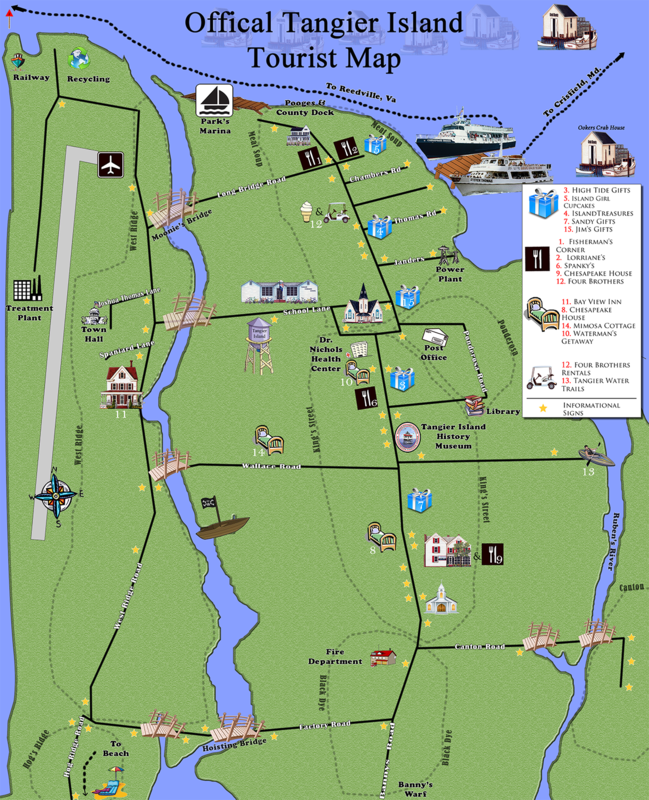 A picnic area, sandwich shops, and gift shops are also conveniently located on the island. Spend some time walking around this quaint island or take a tour on a mini-bus. Either way, you are sure to remember your trip to Tangier Island for a long time to come. We are conveniently located within a few hours’ drive of many popular Virginia destinations. Use the helpful information below to plan your trip today.